Yummy cotton candy colors will be like going to the circus in this pretty tie dye tshirt in supersizes. 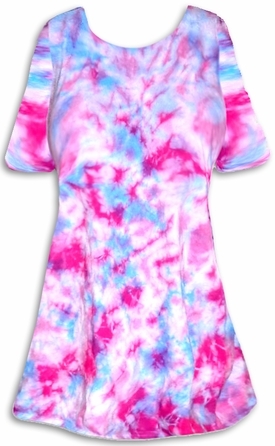 This is a pretty poly/cotton lightweight and very stretchy (like a t-shirt) a-line or princess cut short sleeve top in tiedye. Each top will be unique. Length will differ on each item, please look at the options in the drop down box. The material is very comfortable and you will love the way it feels. 0x: Chest:48" - Hips (appx):58"
1x: Chest:52" - Hips (appx):62"
2x: Chest:56" - Hips (appx):66"
3x: Chest:60" - Hips (appx):70"
4x: Chest:64" - Hips (appx):74"
5x: Chest:68" - Hips (appx):78"
6x: Chest:72" - Hips (appx):82"
7x: Chest:76" - Hips (appx):86"
8x: Chest:80" - Hips (appx):89"